Where Do They Go When There’s No Place To Go? All mass transit riders know from hard learned experience, if it is rush hour never get in the empty subway car. The reason it is empty is always because it smells. Sometimes it is the person who could not get off the train in enough time to toss his or her cookies in a trash can. Unfortunately, the majority of the time it is because a homeless person has taken temporary residence there. The smell can be anywhere from mildly tolerable, meaning if you’re sitting at the other end of the car you may not even realize you’re sharing an enclosed space. Or the smell can be simply unbearable, that the entire car reeks the stench so completely, that the moment the car door opens at the platform you’re running for another car when it hits you. Again, during the height of rush hour it is pretty easy to tell. However, if you are on the train before it has had a chance to fill up and/or it is early in the morning, as it is when I am commuting to work most morning you can get caught off guard. I enter through the center doors and the car is only a third full. I am walking towards my preferred place to sit when a gust of brisk winter air stops me. It wasn’t the coldness of the air, but the scent of the unwashed that traveled along it that stopped me. Sure, enough sitting in the corner by himself was one gentleman. At first casual glance he seemed harmless enough, but on that second look I know what I’m dealing with. I promptly u-turn and move the other side of the car where the smell doesn’t travel. Or so I thought. As the doors open at each stop that same brisk winter breeze served to remind us whose space we took over this morning. Unlike when unexpected guests ring your bell and you’re forced into being civil even though you can’t wait until you can get them out of there, he made his displeasure known. With our slow but steady encroachment into ‘his’ space as the train filled with more people. In alternating turns, if someone sat too close, he would open the manual door between cars to let the cold and air. Remember the closer you were to him, the stronger the stench, especially with him holding the doors open. Almost always the result being the offending encroachers gasping for air and quickly moving away. He would then slam the doors closed, sometimes using his foot to slam it into place if they did not quite connect. He would also go into mini diatribes on how we needed to get the hell out. After all, we commuters were the uninvited guests in his living room. It is amazing how we commuters can adjust and fine-tune out focus in such situations. I was no exception as I read my book, he behavior becoming part of the white noise of the subway PSAs and other station announcements. Only when someone ask if he had left, did I note that the car had been quiet for a couple of stations and he was indeed gone. Still, his presence was felt as no could stand, let alone sit in that corner; his scent lingering long after he himself was gone. I have no idea where he went, I simply hope it was someplace warm and safe. 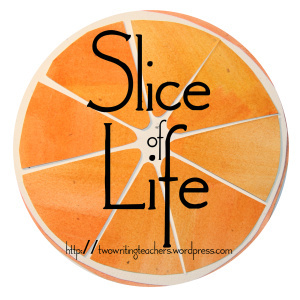 Check out more slices at Two Writing Teachers.